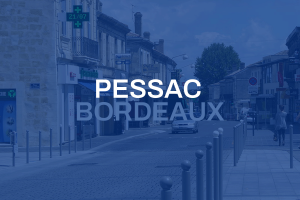 Situated to the south west of Bordeaux and well linked to all the major transport routes, Pessac is a bite-size suburb with 60,000 inhabitants – and famed for its internationally renowned Pessac-Leognan AOC wines. At the end of Tram B (40mins from Quinconces) and only 4 minutes by train from Gare St Jean, the town is easily accessible by public transport. It is also next to the Bordeaux rocade and close to the A63 motorway, with the Atlantic beaches and Arcachon a 35min stone’s throw away. Pessac has a bounty of bars and restaurants as well as a plethora of parks and leisure options – it’s the ideal location to base yourself if you have a family. The compact town centre was pedestrianised and given a makeover a few years ago – the central square has water-shoot fountains that are a smash hit with kids. There are also several terraces to kick back with a refreshing beverage during the extended summer months. The Bordeaux Pessac zoo is a 20min cycle from Alouette France, as is the newly developed ‘Forêt de Bourghail’ nature reserve, complete with play areas, climbing walls, beach football, skateparks, forest cycle tracks and a garden discovery centre. The Cap de Bos and the Sources de Peugue nature reserves are also well worth checking out and are linked up to Bordeaux’s ‘boucle vert’ cycle route network. The town has a large selection of sports on offer – with an increasing number of kids teams and clubs. The Bordeaux Kangaroos American Football team is based in Saige – next to a large site that is set to be developed into a state-of-the-art ecological park. You’ve also got numerous local events and festivals to choose from including the International Salon of Photographic Art, held every February; the local carnival in April; the Bourghail spring festival mid-April; Urban Vibrations, a street festival held every October – with banging music, sliding sports (BMX, rollerblading, skating), street jam (street basketball), graffiti, hip-hop, parkour and breaking – housed in the brand new Salle Bellegrave; the International History Film Festival, held every year in November; a Spanish festival, and the Animasia international anime event. The Fete de la Musique is great here as well and never too busy to get hold of a cold brew or seven. If it’s chateaux you’re after, Pessac has some of Bordeaux’s finest and most distinguished city-based appellations – Château Pape-Clément (Clément V), Château Haut-Brion, and Château la Mission Haut-Brion. The majority of the Pessac/Talence/Gradignan university campus, one of the largest in Europe, is also located in Pessac, about fifteen minutes by tram and car from Bordeaux. For all the latest cultural and tourist info, head over to the Pessac Tourism Kiosk on the main square opposite the medieval church. For more info online, head to the following sites!